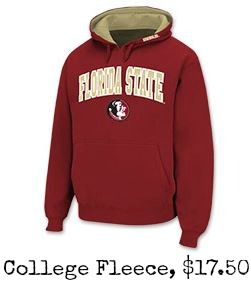 Head over to Finish Line where you can get (2) Men’s or Women’s Fleece College Hoodies for $35 or $17.50 each plus FREE Shipping. These hoodies are usually $40 each so this is a great deal and a fun gift for any college sports fan you may know! We have seen them go on sale for $20 each but this is as low as we have seen them in a while! There are tons of school fleece available but sizes are limited, so go ahead and check to see if they have the size you want. If you plan on ordering several fleece, you can get $20 off a $100 purchase with code 20HLDY100 or $10 off a $75 purchase with code 10HLDY75. Also, do note that some have said these fleece tend to run small, so it might be a good idea to order a size up!